මෙය චීන නමකි; පෙළපත් නම, 杜 (ඩූ) වෙයි. ඩූ ෆූ (චීන: 杜甫; පින්යින්: ඩූ ෆූ; වේඩ්-ගයිල්ස්: ටූ ෆූ, 712–770) යනු ටැං රාජවංශය පාලනය කල සමයෙහි ජීවත්වූ ප්‍රසිද්ධ චීන කවියෙකි. ලි බායි (ලි පො) සහ මොහු ශ්‍රේෂ්ටතම චීන කවීන් ලෙස හඳුන්වයි.සාර්ථක සමාජ සේවකයෙකු ලෙස තම රටට සේවය කිරීම ඔහුගේ විශිෂ්ටතම අභිලාෂය විය. නමුත් ඔහුට අවශ්‍ය ඉඩකඩ ලබා ගැනීමට නොහැකි විය. මුළුමහත් දේශයම මෙන් ඔහුගේ ජිවිතය ද 755 වසරේ ලූෂන් කැරැල්ල මගින් විනාශයට පැමිණියේය. එමෙන්ම ඔහුගේ දිවියේ අවසන් වසර 15 නොවෙනස් වූ අසහනයකින් යුතුව ගතකළ කාල පරිච්ඡේදයක් විය. මුලදී අනෙකුත් ලේඛකයන්ට ආගන්තුක වුවද, චීන සහ ජපන් සාහිත්‍ය කෙරෙහි ඔහුගේ කාර්යයන් ඉමහත් ලෙස බලපෑම් ඇති කරන ලදී. ඔහුගේ කාව්‍යමය රචනයන් අතුරින් එක්දහස් පන්සියයක් පමණ දිගු කලක් තිස්සේ සුරැකී තිබුණි. චීන විචාරකයන් විසින් ඔහු කිවි-ඉතිහාසඥ සහ කාව්‍ය-ප්‍රබුද්ධ ලෙස හඳුන්වනු ලැබිණි. "චීන වර්ජිල්, හොරස්, ඔවිඩ්, ශේක්ස්පියර්, මිල්ටන්, බර්න්ස්, වර්ඩ්ස්වර්ත්, බෙරේන්ජර්, හියුගෝ හෝ බවුඩෙලයර්" ලෙස බටහිර සාහිත්‍යයට හඳුන්වා දෙනු ලැබීමට ඔහුගේ කාර්යයන් මංපෙත් විවර කර දුනි. Traditionally, Chinese literary criticism has placed great emphasis on knowledge of the life of the author when interpreting a work, a practice which Watson attributes to "the close links that traditional Chinese thought posits between art and morality". This becomes all the more important in the case of a writer such as Du Fu, in whose poems morality and history are so prominent. Another reason, identified by the Chinese historian William Hung, is that Chinese poems are typically extremely concise, omitting circumstantial factors which may be relevant, but which could be reconstructed by an informed contemporary. For modern western readers therefore, "The less accurately we know the time, the place and the circumstances in the background, the more liable we are to imagine it incorrectly, and the result will be that we either misunderstand the poem or fail to understand it altogether". "Brooding on what I have lived through, if even I know such suffering, the common man must surely be rattled by the winds." In 756 Emperor Xuanzong was forced to flee the capital and abdicate. Du Fu, who had been away from the city, took his family to a place of safety and attempted to join up with the court of the new emperor (Suzong), but he was captured by the rebels and taken to Chang’an. In the autumn, his youngest son Du Zongwu (Baby Bear) was born. Around this time Du Fu is thought to have contracted malaria. "I am about to scream madly in the office/Especially when they bring more papers to pile higher on my desk." He moved on again in the summer of 759; this has traditionally been ascribed to famine, but Hung believes that frustration is a more likely reason. He next spent around six weeks in Qinzhou (now Tianshui, Gansu province), where he wrote over sixty poems. Luoyang, the region of his birthplace, was recovered by government forces in the winter of 762, and in the spring of 765 Du Fu and his family sailed down the Yangtze, apparently with the intention of making their way back there. They travelled slowly, held up by his ill-health (by this time he was suffering from poor eyesight, deafness and general old age in addition to his previous ailments). They stayed in Kuizhou (now Baidicheng, Chongqing) at the entrance to the Three Gorges for almost two years from late spring 766. This period was Du Fu's last great poetic flowering, and here he wrote 400 poems in his dense, late style. In autumn 766 Bo Maolin became governor of the region: he supported Du Fu financially and employed him as his unofficial secretary. In March 768 he began his journey again and got as far as Hunan province, where he died in Tanzhou (now Changsha) in November or December 770, in his 59th year. He was survived by his wife and two sons, who remained in the area for some years at least. His last known descendant is a grandson who requested a grave inscription for the poet from Yuan Zhen in 813. 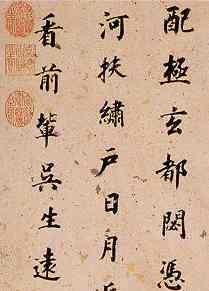 Part of Du Fu's poem "On Visiting the Temple of Laozi", as copied by a 16th-century calligrapher. ↑ 1.0 1.1 1.2 1.3 Ebrey, 103. Holyoak, Keith (translator); (2007). Facing the Moon: Poems of Li Bai and Du Fu. Durham, NH: Oyster River Press. ISBN 978-1-882291-04-5. Seth, Vikram (translator); (1992). Three Chinese Poets: Translations of Poems by Wang Wei, Li Bai, and Du Fu. London: Faber & Faber. ISBN 0-571-16653-9. මේ පිටුව අන්තිමට සැකසුවේ 9 ඔක්තෝබර් 2015 දින දී, 08:15 වේලාවෙහිදීය.